If you ever found out that you have spent more money than you should have to purchase an item, you definitely experienced buyer’s remorse. However, considering the investment value in the artificial turf, you shouldn’t necessarily choose cheap deals just because they offer low prices. This is what you will get at the big box stores, low prices but poor quality, and in the end, you will lose. Therefore, consider buying and having your artificial turf installed from the best artificial grass and synthetic turf installation company in San Diego. The idea behind the business at big box stores is that you get more value in big packages. Buying from these shops limits your choices, and because they buy products in bulk, their prices are lower. But buying from stores which offer limited selection choices means you will not find what you need. 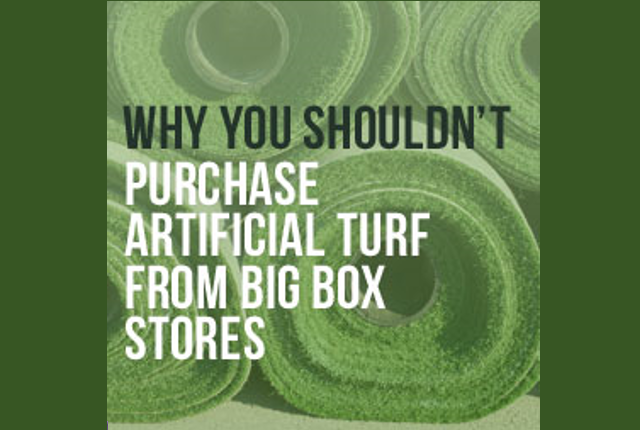 These stores do not employ sales assistants who can give you a proper direction to make better good decisions when choosing your artificial turf. In fact, any business that sells a wide range of different products will have limited information about these products. At first glance, all artificial grass looks all the same. But after a closer observation, you will be able to identify distinct differences such as texture, functions and overall quality. Has the quality been compromised? The products sold at big box shops can be purchased at discounted rates if you are buying in bulk, but the low prices do not guarantee that your product is of high quality. The artificial turf has to be of the highest quality in order to make your outdoors look wonderful for many years. If you purchase a low-quality product, it will not last and it will quickly wear out. These low-quality products will hardly withstand your wear and tear and would also be adversely affected by different weather conditions. Buying plants and pots from big box stores can be used to create spectacular container gardens for your home. But look out for quality when you are buying artificial turf, in this case, quality cannot be compromised. While the stores might offer installation after purchase, this job is usually outsourced to other people. If the first installation is not correctly done, making changes could be very expensive and it could also ruin your artificial grass project. You need experienced professionals to install the synthetic grass correctly the first time around. There are ways you can use the low-quality artificial turfs. They can be used to cover benches or creative designs on your children’s play wall or other fun ideas. But if you are installing the product outdoors for an outdoor turf playground, you will need the best quality turf. It will improve the look of the exterior part of your property, and you will achieve a high-level curb appeal which will add to the commercial value of your home. Your goal should be to buy a product that is guaranteed to last for many years, provide comfort and convenience for your family and a perfect and safe playground for your children and pets.